Another school year starts on Tuesday. Am I ready? I sure hope so. No matter what next week brings, I had a terrific week of getting ready for the new school year. 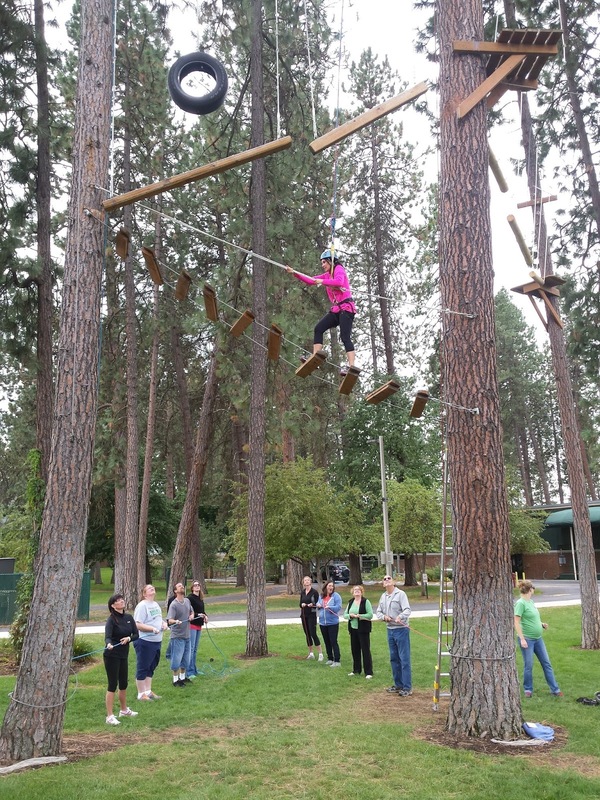 On Monday, my principal gathered our entire school staff for team building and goal setting at the North Idaho College Challenge Course. We've always had a tight staff, but it was amazing to see the trust exhibited on that ropes course. 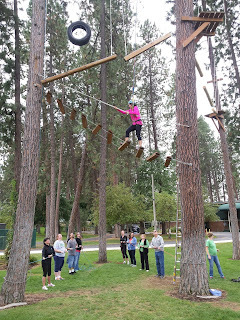 About half of us were willing to go up and try the high wires, rickety bridges, and swinging balance beams, but everyone took part hoisting ropes and working together on the ground-based challenges. It was the best start to teacher meetings I've ever experienced. Tom Schimmer came to speak to all of our district's teachers about grading on Tuesday. He presented the idea of a standards-based mindset for grading. I really got a lot from his presentation, but the best were his explanations of summative vs. formative assessment that helped me understand the difference better than ever. We also received copies of How to Grade for Learning by Ken B. O'Conner for a district-wide book study. I'm excited to delve into this topic. Speaking of book studies, my school staff read Dave Burgess's Teach Like a Pirate this summer. I read it the year before, but I was happy to share the experience with my staff. 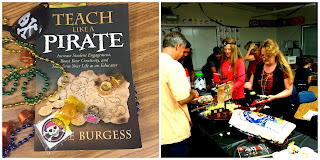 We had a pirate party to celebrate and discuss some of the ideas that came from reading it. Many of the teachers commented that the high school orientation of the book was difficult, but everyone came away with ideas for the coming school year. For me, the best part of our discussions was hearing about the plans to bring more joy into the classroom. The emphasis on testing and rigor has taken a toll on our kids and I'm glad to see our school focus on incorporating more fun and excitement into the good work we're already doing. I put up a Teach Like a Pirate bulletin board in our staff room with space for teachers to add notes about the ways the book affects their classrooms. I look forward to seeing what shows up there. In addition to getting ready for the new school year as a teacher, I am the parent of a kindergartener this year. Thursday was kindergarten orientation for parents and our school's open house. Orientation was a remarkable event. My school's kindergarten team, Title I teacher, and district math coaches gave parents games and strategies to help their little guys succeed. We left the event with great information on assisting our son with handwriting, reading, and number sense. The evening's open house was a blast, too. It totally changed my perspective to experience this event as a parent. My son is lucky to have some friends from preschool in his class, because I think that helped put him at ease. He also got to meet his teacher, find his locker, and play on the playground. He seems really excited to start school next week: I'm the one who's nervous about it. Finally, I was able to end the week with one of my favorite things: seeing and hearing live music. 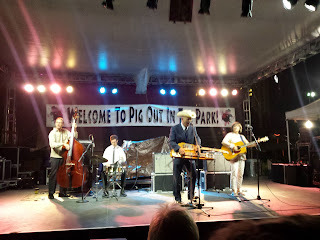 Sarah and I went to see Junior Brown in Spokane at Pig Out in the Park. I've loved Junior Brown's music since I was in high school. I saw him perform last time he visited the area nearly 20 years ago, when the world looked like this music video. If it's possible, he was even better at playing the guit-steel this time around. The sounds he creates with his instrument are absolutely jaw-dropping. When we discussed it on the way home, we figured that he's had 20 more years of practice. I want to continue improving my practice as a teacher the way he has improved as a musician - maintaining my enthusiasm, experimenting with new techniques, and refining my craft. Here's to another year of practice! Here's some more recent concert footage if you want to see what I mean about what happens with 20 years more practice!